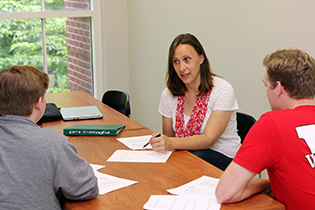 The American Council on Education (ACE) announced today that Wabash College professor Ann Taylor has been named one of 39 ACE Fellows for the 2019-20 academic year. Taylor is the Haines Professor of Biochemistry and Chair of the Division of Natural Sciences and Mathematics. As the first biochemist in the Wabash Chemistry Department, she created the courses and curriculum for Wabash’s Biochemistry major. In serving as Division Chair, she participates in all tenure track hires, reviews and promotions, and serves on the Academic Policy, Faculty Development, Trustee’s Academic Affairs and Dean’s Advisory Committees. She has served on two accreditation steering committees, ad hoc committees on Philanthropy and Childcare, was a Teagle Assessment Scholar, and served as Chair of the Chemistry Department. Taylor is also active in pedagogical research. She serves on the Editorial Review Board for Biochemistry and Molecular Biology Education (ASBMB), and was named an Education Fellow for her work on the ASBMB national accreditation exam. She received a grant from the National Science Foundation to study how students integrate knowledge from prior classes as they learn biochemistry. The materials from this grant were integrated into a commercial online learning system. She has presented workshops on teaching college science to graduate students at the University of Tennessee, and regularly publishes case studies in the National Center for Case Study Teaching.